We’re dealing with some wintery weather here in Tennessee in recent days. Where I’m located, there really wasn’t enough snow to be a factor, but other areas were inundated. It reminded me of something I saw a couple of weeks ago online. So what do you do with a baseball stadium during the winter months? The folks in Cleveland figured it out. It’s called Cleveland Snow Days. They installed an innertube luge run, an ice skating rink and a snowball tossing area along with some other nifty stuff during the weeks before and after the holidays. Even cooler is that the baseball dugouts were warm-up areas for the chilly visitors. How awesome would that be to hang out in the dugout? Pretty awesome if you ask me. It brought people back to the downtown area during a time when foot traffic and visitors are at a minimum. Very smart. And it looks like it would be fun. 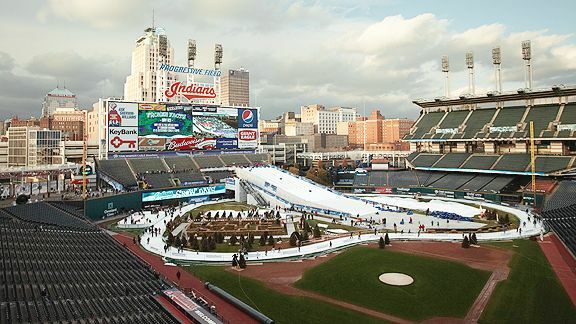 So until the first pitch of spring, here’s to Cleveland and their winter baseball wonderland.